I'm quite curious to see what the end result looks like. The footage especially. Action cameras have limitations mostly due to small sensor size and fixed optics, not so much with bitrate. As for mounting, I find that the head tube and seat tube mounts give the most stable footage, racks seem to introduce vibration, and handlebar mounting adds wobble, which is (for me) unwatchable at low speeds. I left this project for a few other things, but Bike to School Day impending in May has reignited my interest in this build. I have no significant updates for the blue Twenty, except that some much needed bits from Framebuilder Supply have arrived. As you can see, I'm not really keen on leaving the factory rear brake bridge alone, though I do have a Tektro 900A on order, just for experimentation. This test did bring to light that even the mini Z-axis stabilizer was not enough to isolate any of the bumps and rattles from the frame, though - admittedly - a fair amount of that is caused by the Pletscher rack flexing side to side. I really think that wire-suspended isolator I posted early in this thread is the proper way to go (when paired with the stabilization arm) for this sort of mounting. 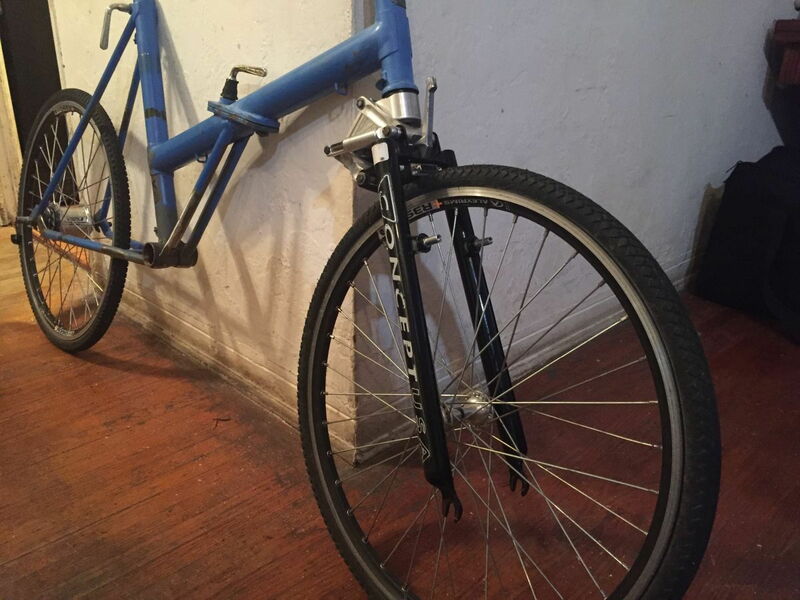 Even if I basically integrate a rigid tube rack into the Twenty's frame Raleigh Chopper style, way too many vibrations come through the road to expect this to do anything in my favor. 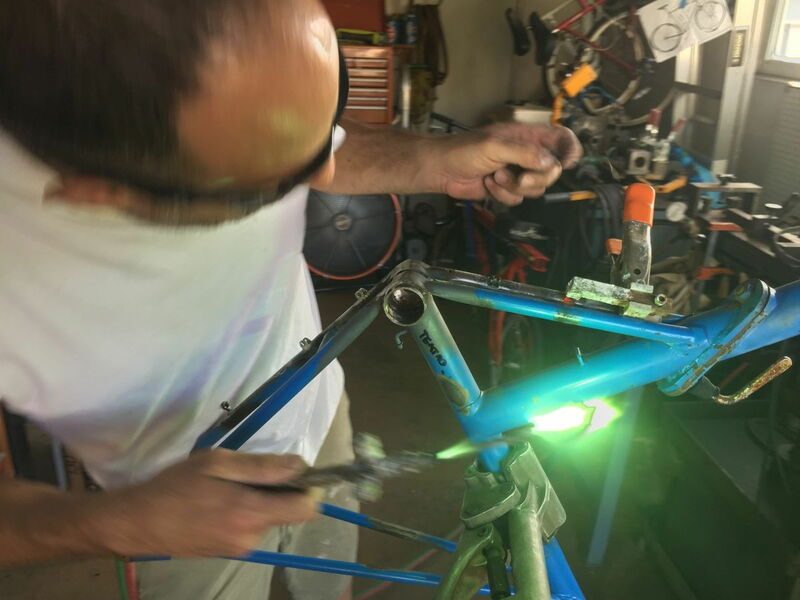 The bumps that come through the fat-tired '70 Twenty blur iPhone footage easily, so the skinny-tired 451 Twenty being built for the purpose could be even worse. It needs the isolator. Mind, I had to fit two lens bags between this and the saddle, hence why the rails sit outboard so far. 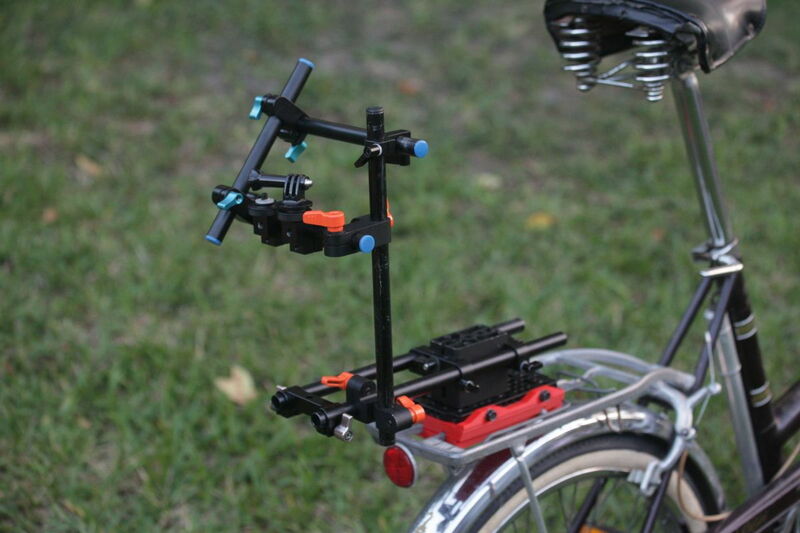 I would have preferred the assembly towards the saddle (and point of rack mounting). I've also been looking at the stabilization of the GoPro Hero 6 and 7 vs. the earlier models, and I dare say that most people would find the result from an isolated GoPro 6/7 more than acceptable for this job, given their superior image stabilization from previous models. But I won't settle for "pretty good" if I can push the result further - no matter the cost to my sanity - and I still want to build something that could hold a DSLR if necessary. I really don't think road vibrations are good for these little cameras either - proper isolation is as much a stabilization issue as it is a longevity issue for these, in my opinion. One other thing - I wouldn't mind running the cameras on a simple roll-axis/1-axis gimbal, if nothing else. That'd ensure the cameras also stay level with the horizon. Last edited by cudak888; 03-15-19 at 08:04 PM. I recently bought a modern Pletscher rack from Rivendell Bikes. I've mounted on my 2003 Cannondale Comfort/MTB (26" wheels) and I'm astounded by the stiffness and rigidity when compared to old Pletschers. Of course it is currently out of stock but take a look at the pictures to see how you might add to the bracing on a vintage one to improve the "sway" you experience. 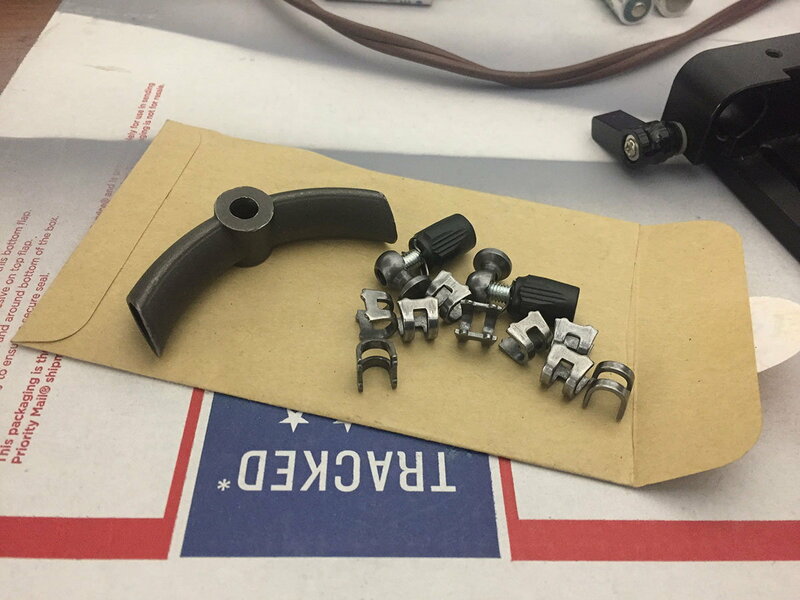 Part of the stiffness comes from these mounting brackets which attach to the eyelets at the dropouts. 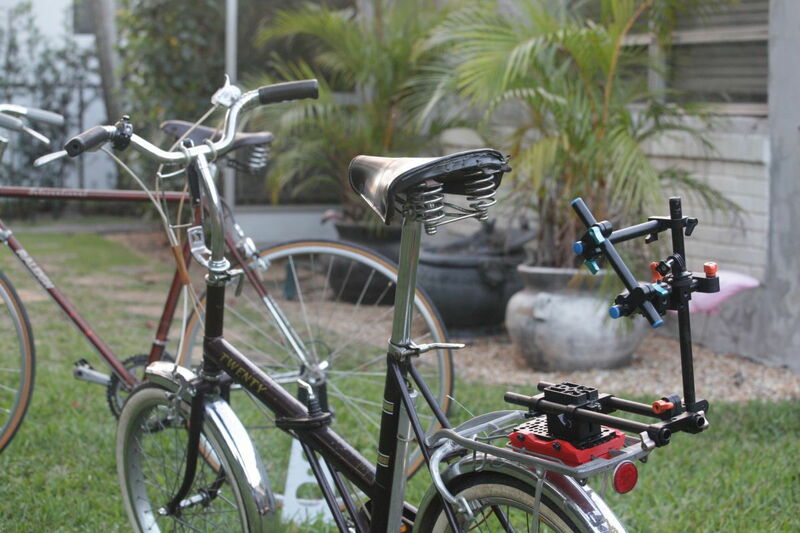 I remain fascinated by your project and it would be cool to have one of your film/video friends film you in action while filming Bike to School Day in May. That new Pletscher rack has two struts on each side. The old one had only one on each side. 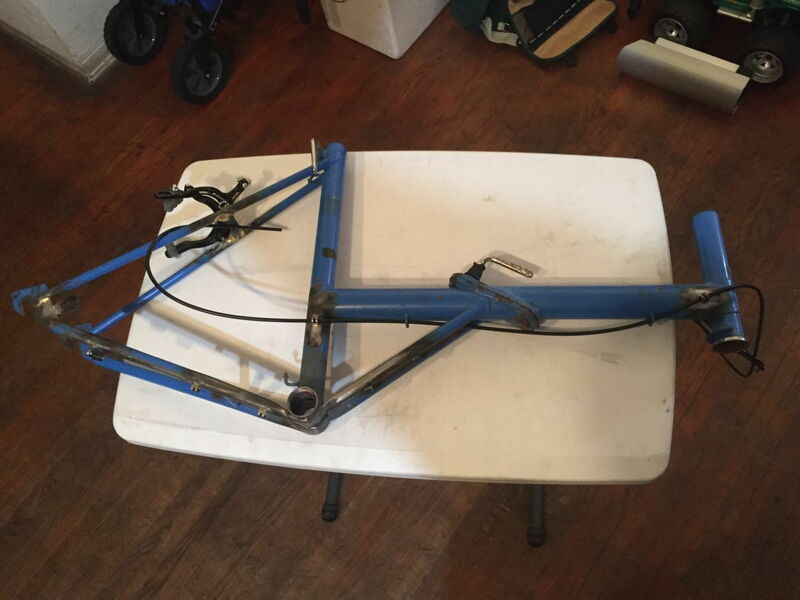 I just won a 26" AMP Research fork on eBay, so things ought to get really interesting once it arrives - namely, the conspiracy theories of how dangerous the fork will be if it gets modified. I plan to go dual-pivot in front, so mounting the brakes will pose some more interesting workarounds - the AMP, being an MTB fork, is designed for cantilevers. 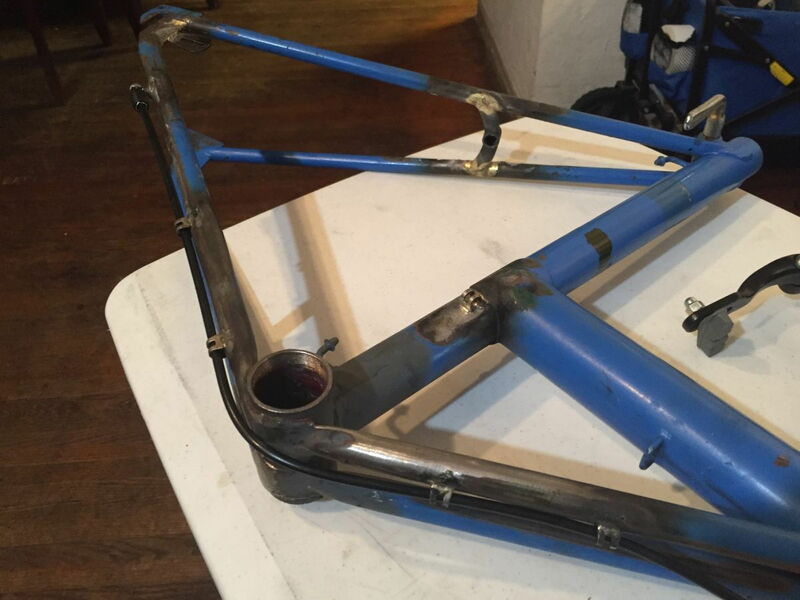 In the meantime, I've been prepping the frame for its rear brake bridge modifications and shifter cable routing. The rear bridge looks terrible, as I hand-mitered this thing and took off a bit too much the bottom on one side. It looks lopsided, but it isn't. 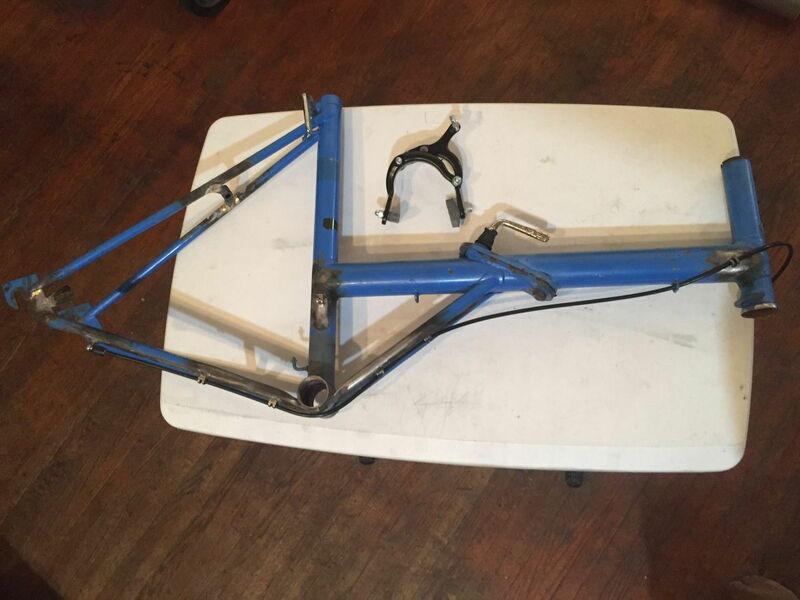 Not more than any Trek rear bridge from the '70s, anyway Filleting it should solve the visual issue. 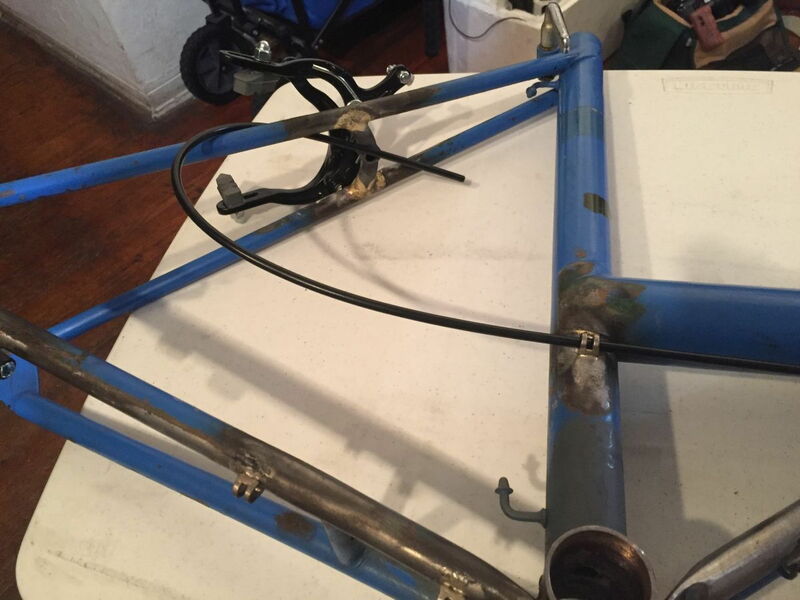 The routing for the shifter cable will be run down the inside of one of the main tube struts and down the bottom of the chainstay to a brazed-on adjuster barrel, reversed from the usual mounting standard. I'm also planning on running an extra braze-on guide for the rear cable loop. Modifying a Tektro R559 for reverse-cable insert should be tricky, but interesting, to say the least. Last edited by cudak888; 03-17-19 at 05:57 PM. If it was a Schwinn, maybe! Since I don't want it to show up in reflections, I'm pretty much stuck painting this one flat black when its done. Far from the color I'd prefer it in, but it'll do. I'm thinking of cutting replicas of the entire 1970 Raleigh Twenty decal set in a slightly lighter grey and having them cleared over - just to make it a bit more interesting. Some progress from the Mad Scientist's lab on this one. First of all, this thing has a new name which I'm quite pleased with: Twenty/Twenty (or 20/20, if you prefer). I'll probably come up with something built around a normal fork crown with a steerer installed for strength + caps on the ends. 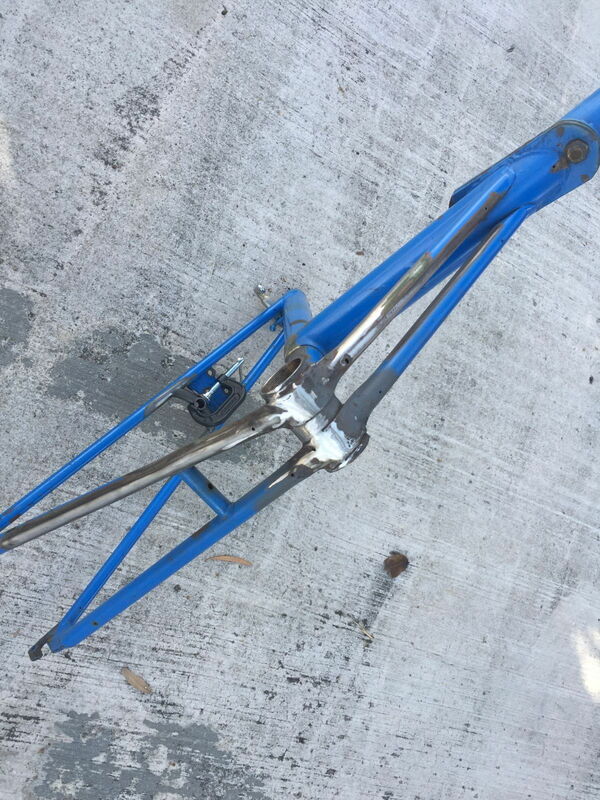 I know the bottom of the Twenty's headtube is going to get cut down significantly to bring the geometry back to something more sensible, given that the suspension stack adds far too much height to the front. The steerer tube is quite short though, and it may present a problem. I've heard that Brion at AMP was still willing to do steerer replacements back in 2010, so I've fired off an email to them to see if they're still on board with this. In the meantime, Mike carved out some time for me so we could braze on a few bits. Or as I like to say, we "fixed it with fire." The braze-ons I chose aren't particularly pretty, but they were accessible and went on well enough. Since this isn't supposed to be a show queen, we also put them on quickly and didn't spend too much time worrying whether they look good or not. They are, nevertheless, quite functional. It solves one of my pet peeves with the original Twenty, namely, the inaccuracy of the clip-on cable routing. I think that's been solved quite well here. I've also worked in an adjuster barrel - reversed - so I can bottom out the Sturmey indicator adjuster and make my adjustments on the braze-on. Obviously, I'll be soldering a cable together, given that there's not much room for error with this system. Also, the looped rear brake cable housing has also been a sore spot with me, so there's a braze on placed on each side of the seat tube to keep the loop tidy. One will eventually get chopped off once I've settled on a rear brake and know which side it takes cable up from. 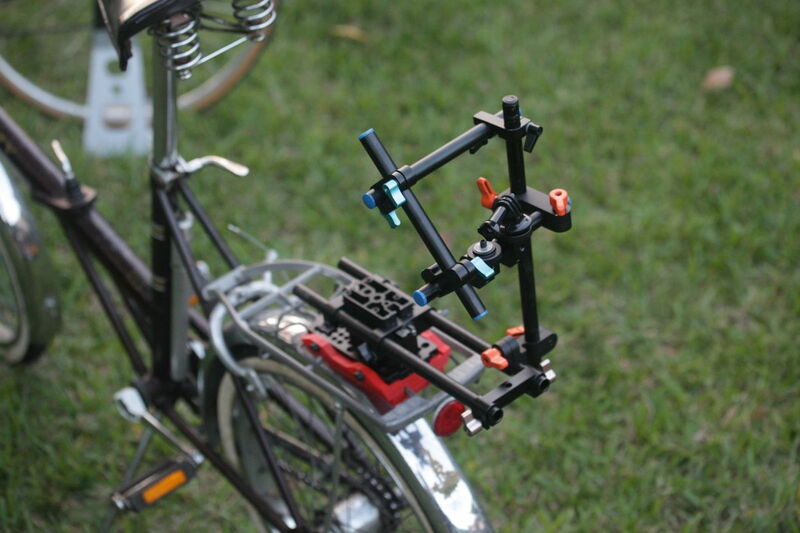 Then there's the chainguard mount, which is much stronger than it looks. It's just the SKS bolt-on piece cut down and brazed on. It is terribly ugly though, and I'll probably file it to match the frame angles. Last edited by cudak888; 03-31-19 at 08:44 AM. Kurt, your 20/20 is rapidly morphing away from its roots. Sort of like how customizers transform a Model T into something it never was meant to be. Or how that father/son on Discovery build a completely different motorcycle around a Harley engine. Along with your stealth black paint job and the stealth black custom "20/20" decals, it needs something else--- such as "Media Maven." 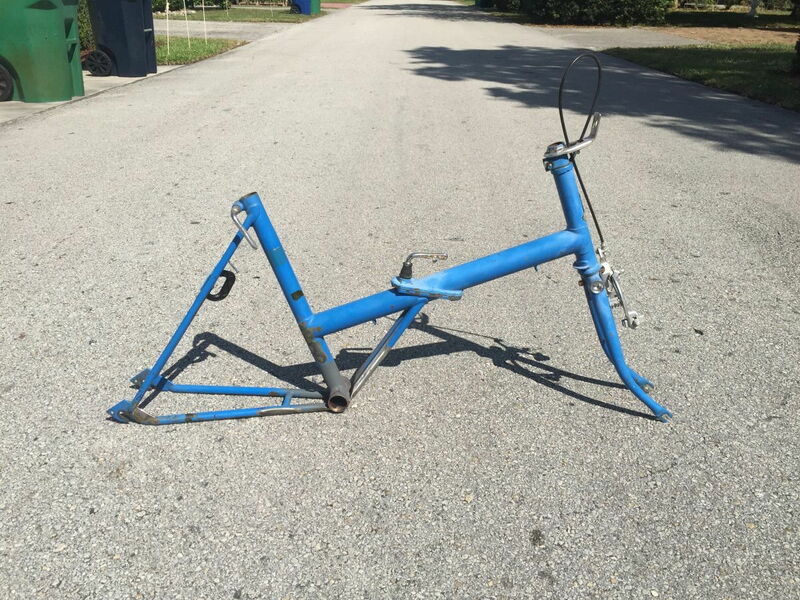 Oh I don’t know, it still has it’s pegs for the pump! Following your project eagerly but it’s NOT giving me urges with my Twenty. It's definitely a restomod, I won't deny that. 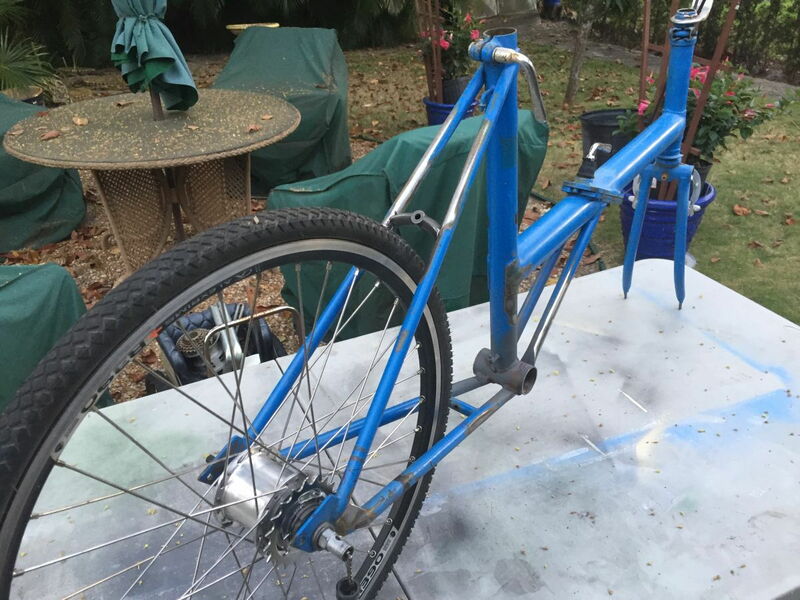 Still, I'm determined that it still looks somewhat like a Twenty when its done, or at least something Raleigh-related, as those additional seatstays will add a significant amount of Raleigh Chopper to the mix. 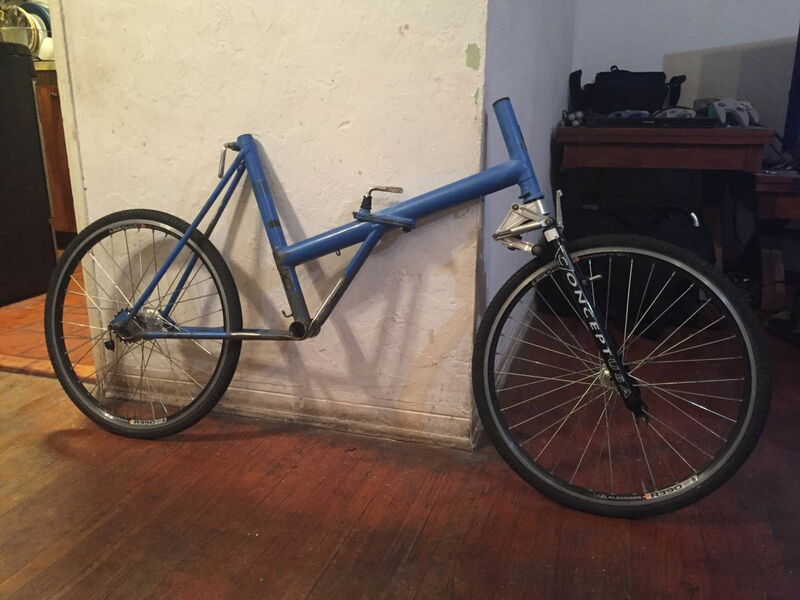 Granted, the SKS Chainboard changes the look of the bike drastically with no other modifications, so I might be barking up the wrong tree here. Speaking of which, the original one-piece handlebar has to stay. I know many don't like it in comparison to the two-piece version, but the mini-North Road handlebar is one of the top reasons I enjoy Twenties in the first place - without this bar, the magic isn't there. 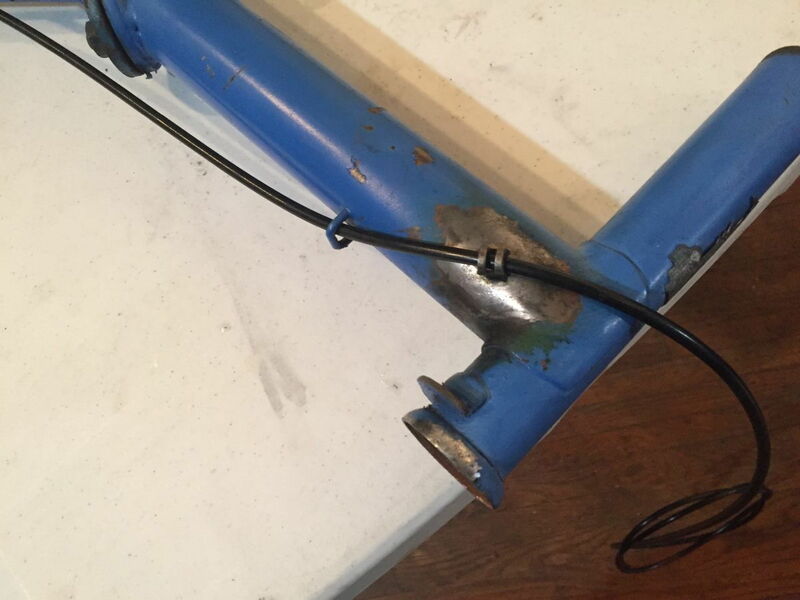 This means the original bar/stem unit needs to get modified into a threadless design too, which means finding something like this in 1" and brazing it into the bottom. Also, we'll have to finesse a bolt stop into the curved neck. Should be utter madness, if nothing else. I'm not sure what I'm going to do with those pegs. Honestly, I hate the pump location on the Twenty; it makes it impossible to pick up the bike from the seatpost by hand. I wouldn't suggest any of these modifications even if someone were to modify their Twenty - save for the very handy shifter cable guides. The fork is downright crazy. And I'm OK with that. Last edited by cudak888; 03-31-19 at 09:15 PM. For the pump pegs--- mount a lighted "ON AIR" sign to signify when the camera is recording. 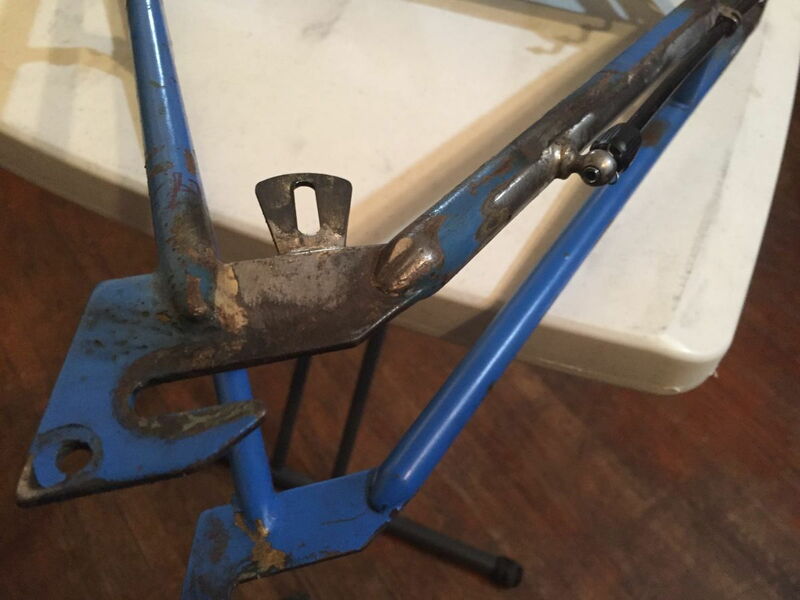 A titanium stem mount? Now that is over the top for a 20 (or even THE 20/20)! Kurt, when this all comes together, I'm going to share this thread with a friend from our summer lake cottage neighborhood. He's in the Academy and works primarily as an assistant director and producer who films all the special sequences which become mixed into films or videos. Currently he's working on a Netflix series which will air later this year or early in 2020 (sic). It is fascinating to talk to him about how he goes about filming things. He'll really like your ingenuity and tenacity. "Fewer pump pegs, more mpegs and jpegs." Weight is the enemy. A heavier camera makes everything heavier. That GH5 is great (I shoot M43 too) but the weight of it is increasing the weigh of everything below it. Have you seen the new Sony RX0 II? 1" sensor. Shoots 4k. Vibrations are hard to dampen. It's the low amplitude/high frequency stuff that will kill a shot as much as the high amplitude/low frequency stuff. That damn z-axis. I have a DJI Osmo Mobile. It's pretty cool but doesn't smooth out the z-axis. Because of all of this, I've figured out numerous ways to mount a camera to a backpack that I wear. These days, a handlebar-mounted phone connected via wifi to a gimbal/camera may give me the control that I need while I ride. Haven't tried that yet but maybe this year. Best of luck. Interesting challenge! I'll gladly take one in steel, but I can't find one - especially in 1". Can't find 1" threadless stem extenders in steel either; that'd be the most ideal donor piece to work around. If anything, he'll probably get a good laugh out of this. Everything I'm trying to do here could be achieved relatively easy with two camera operators on a golf cart. Thing is, I'm one guy in the middle of a bike ride trying to do it all and enjoy the ride. Now you have me wondering how I could mount a "PSD" or a "PNG" to this bike now (or rather, an "MOV" or an "MP4"). Even though that's impossible. Maybe I could put a subscript under the "20/20" lettering: "H.265 equipped." Interesting points. I now have two GH5s in the fleet, so it's an option, but I've finally acquired a GoPro Hero 7 Black and the stabilization is more than enough. I mounted it to the same rickety rig I have on the back of the stock '70 Twenty, and it took out even some of the rougher bits (driveway-to-tarmac transitions). It's not without a few artifacts from motion blur, but the results were very impressive given that the camera had to mask the vibrations from the Pletscher rack during the entire test. I don't mind the bike and rig being a bit heavy; I wouldn't have started with a Twenty if weight were an issue in the first place. I want to say that it might help smoothness too, though that rule of thumb generally applies to shoulder rigs. I've seen the RX0 II. Very expensive little number for what it is. Since it doesn't have image stabilization either, that makes eliminating the onboard vibrations even more difficult. The RX0 II may be better for bitrate and overall quality by virtue of the lack of in-camera processing, but I'm not convinced that this route might even be harder for a good result. I'm quite convinced that I'll be stuck using some sort of wire mount vibration isolator between the bike and the camera anyway, if I want the best possible footage. 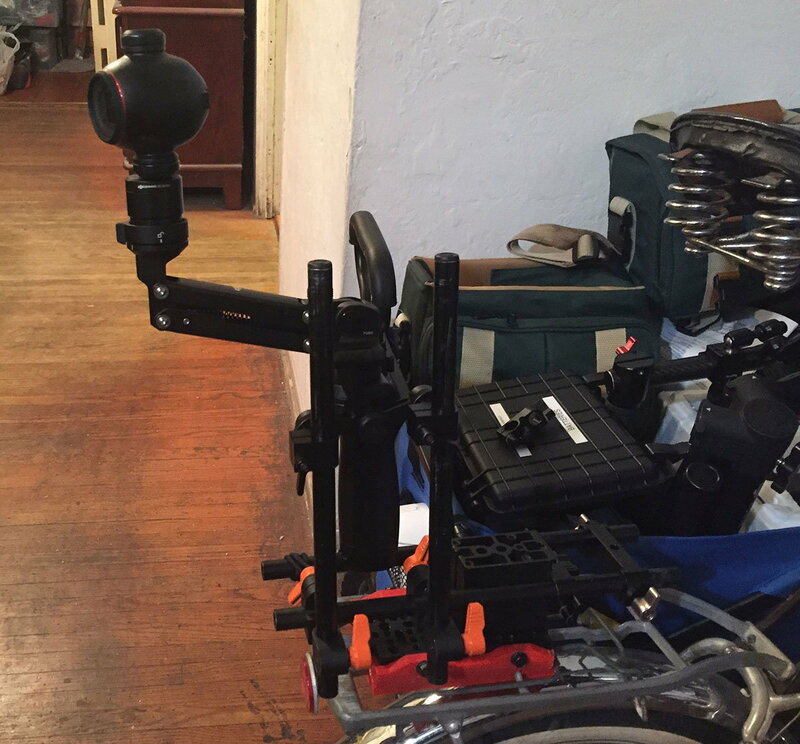 I tried that Z-axis stabilizer that's offered for the Osmo. It's a complete waste - on or off the bike. Even handheld, the spring is not stiff enough to prevent the arm from traveling its full axis and hitting the bump stops (like it even has bump stops) at the limits of its travel. It has a tensioner, but that only helps the gimbal rebound upwards too quickly (or hit its lower limit of travel too quickly, if loosened). I might have mentioned this earlier, but the Osmo I tried kept drifting to the right when pivoted on the roll axis - either way. Piece of crap. 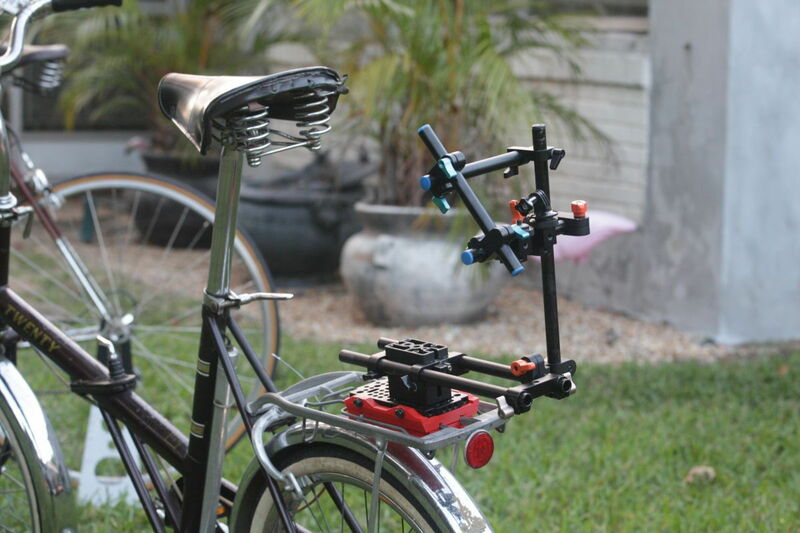 I'm quite convinced I'll probably just use GoPro 7's on wire isolators once I'm done, but one of the other tricks I have in mind is having each GoPro mounted on a 1-axis gimbal, to compensate for the bike's roll. I've lost a few potential shots for lack of that one axis, especially when putting the bike on it's kickstand. Believe it or not, the lateral shift (as the bike is put on its stand) isn't as much a problem as one might imagine. FYI, I just bought a Feiyu Tech WG-2X 3-axis gimbal for GoPro cameras. I'm hacking it to work with a 360 camera. Initial tests mounted to stem a mixed bag (some footage good, some unusable) but I've got to play around with the settings and mounting a bit. Seems like a workable bit of kit, if it doesn't drift. 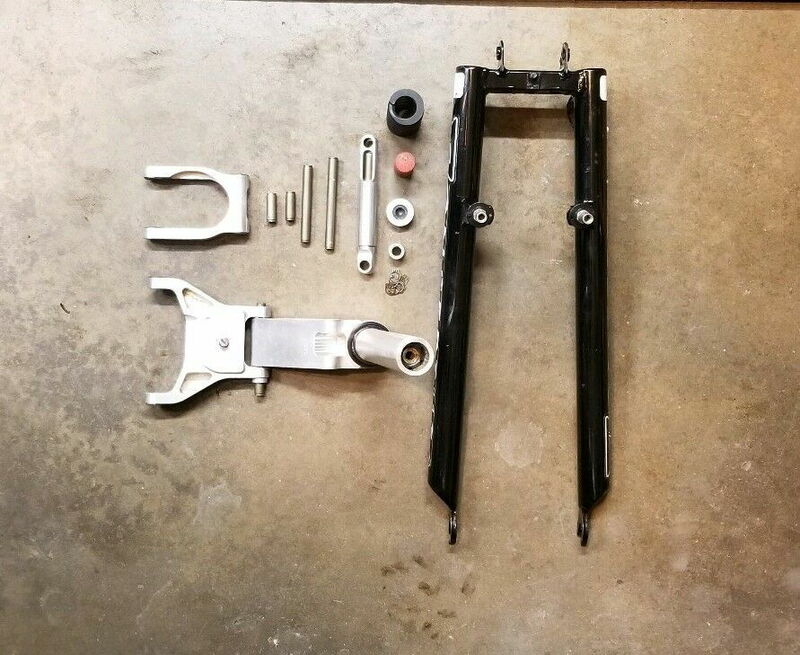 Have you tried direct mount to the frame? What model GoPro? 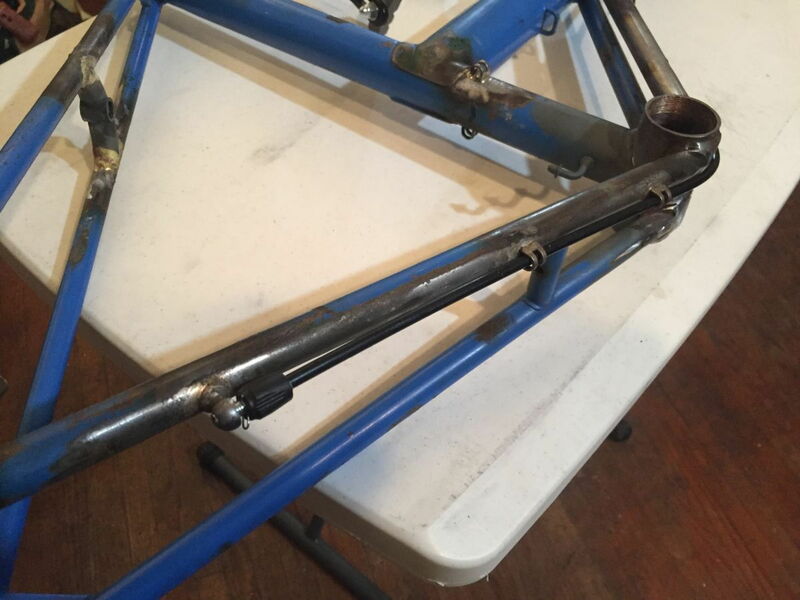 Seatpost binder bolt - what brand, how to measure?